Anyone who has been collecting records for a long period of time, in my case over fifty years, is bound not only to have favorite performances but favorite-sounding performances as well. Here I've listed (alphabetically) a few of the many classical CDs I admire for their natural, realistic sonics, many of the discs as old as the first recordings I ever owned, and some as recent as the past year. As with any list chosen from thousands of the best products available, this one is quite personal, and, of course, since no one can claim to have heard everything, it's limited to my own experience, not secondhand advice. Of the numerous recordings of the Brandenburgs, this one from the mid Seventies, among the first using period instruments, is probably the smoothest, most truthful, and most well defined. Although it may not adhere to what we consider today the most-accurate period playing practice, the performances are certainly agreeable. Incidentally, I've seen the recording released on LP and CD under a variety of labels, from Philips, SEON, RCA, and now Sony. You can't beat the performers, either--Sigiswald and Wieland Kuijen, Lucy van Dael, Anner Bylsma, Frans Bruggen, Bob van Asperen, Gustav Leonhardt, and others--most of whom went on to further glory in the period-instruments field. From 1968, Sir Adrian's Lyrita recordings of Arnold Bax's tone poems have long been favorites for lifelike orchestral sound, and no one has bettered the interpretations. Tintagel and November Woods are particular favorites, the latter virtually dripping dew from the trees. Warm, smooth, spacious, these recordings are just a pleasure to listen to. It's hard to go wrong with the sound of any Reference Recordings disc, but this latest from the company is about as dynamic and truthful as it gets. 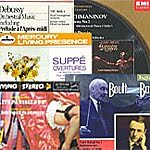 The 1970s marked a golden age for several major record companies, including Philips, whose Concertgebouw recordings displayed some of the most pleasantly ambient hall bloom of anything ever put on disc. Listen especially to the "Images," and you'll hear a real orchestra in a real auditorium. Quite simply, the finest-sounding vocal-orchestral recording I have ever heard. RCA's biggest competition for audiophile dominance in the late Fifties and early Sixties was from Mercury's "Living Presence" series, and the appearance of these Mercury stereo recordings on CD was a subject for rejoicing among music lovers. Start with Piston's "The Incredible Flutist" (Ballet Suite), and you'll see why. The good people at Smithsonian FoM recorded this trio of players as naturally, as warmly, as realistically as any small ensemble you'll hear. I've owned this 1962 recording on London and Decca LP, Decca CD, and now on an audiophile remastering on Winston Ma's LIM, and the recording has never let me down for absolutely fidelity. It won't knock your socks off, but it will impress you with its warm, refined acoustics. Recorded by EMI in 1973, again during a golden age for record companies, this disc went directly to the top of the pile and has never fallen from it. The "Uranus" movement has long been a demo piece for my various stereo systems, with depth, transparency, and deep bass in abundance. The EMI disc sounded good; the Hi-Q remastering sounds even better. The folks at FIM remastered the original tapes of this classic jazz set to the best audiophile standands yet in this "Fifth and Ultimate Edition." It's very expensive, but to the dedicated audiophile, it may be worth it. From 1970, this lovely recording will probably never win any prizes for its sound, yet I have always felt it was among the best, maybe THE best, sounding Mahler ever put to disc. It helps that Horenstein had a loving way with the music. EMI originally issued this recording in their quadraphonic Studio Two line, and it has always sounded spectacular no matter the number of channels. In America, Klavier released it, and the edition I own is a Klavier gold disc. Despite excellent performances, excellent dynamics, excellent impact, and excellent transparency, Klavier seems to have pulled the plug on it of late. I guess excellence isn't always as lucrative as I thought. When EMI was issuing Otto Klemperer's stereo recordings on LP from the mid Fifties to the early Seventies, I thought they sounded thin, bright, hard, and forward. But their latest incarnations on CD are almost universally fine, with detail and transparency galore. Needless to say, their remasterings from Japan are even more so. And for those folks who only think of Klemperer as heavy-handed, one listen to his Mendelssohn should change their minds. This 1973 release often passes under the radar, but for audiophiles it's been a favorite for a very long time. It simply does everything right, especially in the area of detail and definition. This early recording from Marriner and the Academy has sounded good from the outset, but it's never sounded as good as in FIM's XR24 remastering. The first moment alone may leave your jaw on the floor, and the strings are among the most realistic ever recorded. The XRCD's sound is firmer, better focused, tauter, and crisper than DG's regular release, and the slightly close-up miking is extremely dynamic and well detailed. That Ms. Mutter's performances are first-rate is just icing on the cake. My guess is that if you own an original LP of this celebrated 1954 RCA "Living Stereo" recording, it is probably worth a small fortune. It's one of the earliest stereo recordings ever made for the home, and it proves that there hasn't been a lot of improvement in the recording field since. In a word, the sound and performance are fabulous. The Japanese JVC remastering is in their XRCD series, and it only makes a good thing better. Over the years, the folks at Telarc have made any number of fine-sounding discs, and this one probably exemplifies their recording technique as well as any. It's big, wide-ranging, and reasonably spacious. Some of the lushest, most-romantic music ever written in some of the lushest, most-romantic sound ever recorded. Enough said. I can't imagine any audiophile being without this one. Not only do we get a dynamic performance, we get sound that is equally thrustful, accompanied by a beautifully balanced ambient bloom. Here's a very dynamic, transparent recording of music by Glinka, Mussorgsky, and Borodin, done up in some of the most-exciting performances imaginable and remastered in LIM's K2 HD audiophile processing. I have never been too keen on DG's sound, usually finding it too hard or too soft or too artificial or too something. Not so here. The DG engineers captured the Orpheus ensemble perfectly, with plenty of impact, range, and dimensionality. These transfers to CD from a 1958 Decca 4-track tape are about as dynamic, as clean, and as wide ranging as a recording can be. We're listening to genuine demo material here, from the big bass drum to the crystalline midrange to the sparkling highs. LIM's audiophile remastering of this 1978 Philips recording is probably as close to the sound of the master tape as one can get. It's warm, resonant, realistic, and ultrasmooth. This binaural recording is rather unique, using a Neumann KU-100 "dummy head" microphone system, a replication of the human head for increased naturalness through headphones and an increased sense of depth through loudspeakers. The result is superbly realistic sound. More from Mercury's "Living Presence" line, this one has all the qualities any music and sound lover could want, from the most-hushed silences to the loudest, most-undistorted crescendoes. Great stuff. This may be the most impressive disc I've ever heard. Note its clarity, its transparency, its depth, its localization of instruments, its reach-out-and-touch-it realism. It's quite astonishing, actually. When Sheffield originally recorded and issued these Debussy, Prokofiev, Stravinsky, and Wagner performances direct-to-disc, they were about the best-sounding classical LP albums one could own, yet Sheffield would never quite match on compact disc the sound they produced on vinyl. However, the two gold CD editions they later released were still plenty good, even if the acoustic is a little dry. Dynamics are wide enough to blow your speakers open, so be careful. Telarc claims the cannon shots on this digital recording dip down as low as six cycles. In addition, the imaging is excellent. If you get the remastered LIM, things are sharper still. Recording engineers have not always been kind to period-instruments ensembles, but not here. Recorded in the Scoring Studio at Skywalker Sound, the results provide just about everything you'd want in an audiophile disc: good clarity, good imaging, strong dynamics, and strong impact. Here's another amazing transfer from HDTT (High Definition Tape Transfers). Recorded by Decca in 1957, there is no way to tell it wasn't recorded today by one of the best audiophile companies in the business. Remarkable smoothness and transparency. The disc features the LAPQ performing percussion music of Kraft, Naidoo, Griswold, Pereira, Schankler, and Deyoe. The sound is outstanding for its clarity, impact, air, transient response, and overall presence. Hi, While in high school, beginning to discover classical music, I bought RCA's LSC-2267 (Gaite Parisienne with Fielder and the Boston Pops). Still have it, and in very good condition. But it was issued in 1959, not 1954 - when, I believe, stereo was not yet available. Is this the same recording to which you refer as "being worth a small fortune"? RCA actually recorded Fiedler's "Gaite Parisienne" on June 18, 1954, but I don't believe they ever released it in stereo until 1959. The original LPs in good condition are much coveted by audiophiles.